Back in July last year the Chinese manufacturer Xiaomi unveiled its Red Rice Hongmi with quite impressive features and beautiful colourful design. Now the device will be making its trip outside China, targeting Singapore as its first stop towards the global market. The Chinese phone maker does have some serious advantage in reading the market especially after having Google’s Hugo Barra bagged, the one who teased the enigmatic Xiaomi Redmi line. Now it appears that the rebranded Hongmi line will finally make it to other parts of the world. The manufacturer will be targeting the market for mid-tier devices and wants to give beginners the best possible device that is easy to use. So in case you don’t consider yourself a sophisticated smartphone user and you’re about to be impressed with the Xiaomi Redmi. 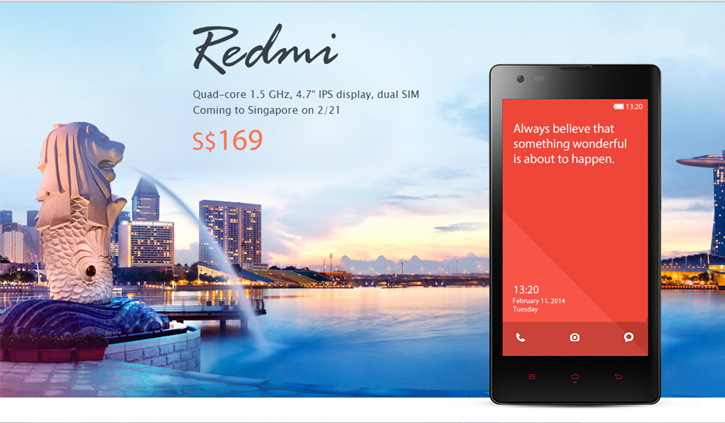 The smartphone is priced at 169SGD ($139) and will hit the shelves in Singapore later this month on February 21. The device sports a 4.7-inches display with screen resolution of 1280×720 pixels and operates with a 1.5GHz quad-core MediaTek CPU paired with SGX PowerVR GPU that gives the ability to play H.264 at 1080p videos quite smoothly. The handset rocks an 8-megapixel Samsung rare camera coupled with 1.3-megapxel front-facing snapper with 720p video support. The audio system of Xiaomi Redmi boasts its rocket sauce directly from Dirac, the Swedish manufacturer famous for its audio system for luxury cars. The phone also features a dual SIM support, but the catch is that one of the SIMs supports WCDMA 3G and the other- GSM 2G. In terms of software, Redmi is running Android 4.2 Jelly Bean out of the box with MIUI Launcher on top. The handset launched in China in three different colors, including Chinese red, metallic grey and ivory, so it’s most likely to visit the other markets offering those attire options.